The game wasn't pretty, but photographer Stephen Dachman got some great shots of the action. After DTLB and Cambodia Town saw over 70,000 bicyclists, walkers, skaters, and explorers invade the streets for the City of Long Beach’s 2016 ciclovías, it seems like they can’t stop and won’t stop: the fourth Open Streets event will take place in East Long Beach from 11AM to 5PM on April 29. The 2.5-mile “University” route—one significantly smaller than DTLB’s Beach Streets but more expansive than Cambodia Town’s route—and probably with good cause: with the nearest Blue Line Station a mile away, pedestrians won’t have immediate access to the route and even the most aggressive of cyclists aren’t fans of riding on Anaheim with traffic—will stretch along Anaheim Street between MacArthur Park in Cambodia Town to Recreation Park at PCH on the Eastside. The coolest part about this Beach Streets? It highlights our University’s hood, an area rich in mid-century modern architecture, suburban sprawl (in the good sense: gorgeous homes, weeping willows, idyllic Long Beach), and the operation that is Cal State Long Beach. Even better? Jax Bicycle Shops—one of the city’s most iconic businesses dedicated to the two-wheel life—will be acting as a major hub for the event. 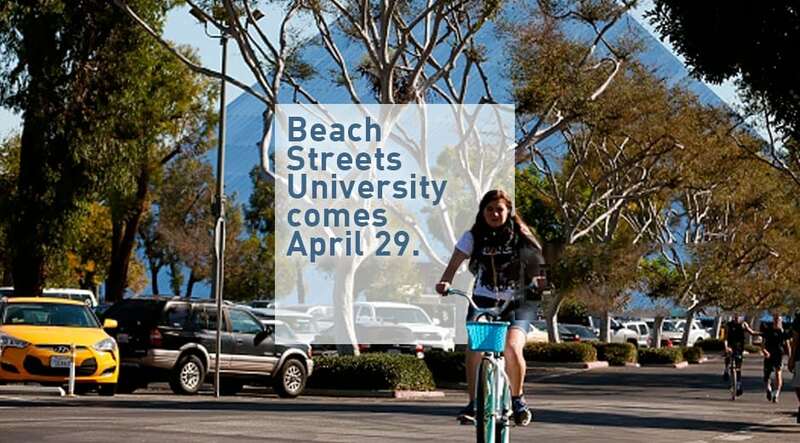 This will certainly be a Beach Streets unlike any other and, well… We can hardly wait.